I took my children to Toys"r"us by bus. As it was around 1 p.m. when we got off the bus, we went into McDonalds first. They were very pleased to eat there, but I thought chips were very salty. At Toys"r"us they enjoyed to view a lot of items. I had to buy a birthday present for my daughter's friend, so I encouraged her to select one. She examined one by one and finally found a very pretty horse toy. It was a bit surprise to me because she didn't ask me to buy the same one for her. Oh, but she asked me to buy a small stuffed toy dog instead of it... I tried to let her rethink because she had already had a lot of stuffed toys, but she was stubborn. I thought I had no plan to take them anywhere this summer and it was much cheaper to buy toys than to take a trip anywhere. Therefore, I bought a small stuffed toy dog and a small toy car for them. Yes, I know I might have been wrong, but I had been usually a strict mum. I was an easy mum just for today. It is good for a change, isn't it? Even if you see a man wearing Scottish national dress in Edinburgh, he is not Scotsmen. He is probably a tourist because Scotsmen don't wear their original Scottish dress only at special times, not everyday life. English is spoken in UK mainly. But Gaelic is in west and north of Scotlant and in Northern Ireland, Welsh is in Wales. There are more languages in UK like Hindi, Urdu, Punjabi, Mandarin and Cantonese. tag : Britain British U.K. I've been busy for these 7 days. I had to set up my new PC and got some work to do. I've just finished them this morning, so I'll keep my diary like before. What I would like to tell you most is my new PC. It has more power and is much silent. Now I'm trying to connect my old small monitor to it. With dual display, I spent less time on my work. Oh, yes. I planted 3 small trees by the fence in the front garden. I'm going to lay Cotwald's stones on the rest of the space. It was a lovely day again. But I couldn't do the garden job because the order might come. I didn't know when they came. In addition, some job agent called me by turns. As I uploaded my CV last Saturday, they might find mine this morning. I didn't like telephoning, but I had to for the job hunt. I hope I can get a job which meets my requirement. I took my children to the library. My boy found a book for this week and my girl found 3 picture books for today. I'll go there only with my girl tomorrow. My new PC didn't come today. But the order from Japanese Food Company was delivered in stead of it. My son was interested in the contents and helped me to check them up. He was pleased when he found REI-MEN, which he loved to eat every summer. So, I couldn't go to the English lesson today, As I have another appointment tomorrow, I have to be absent again. It will be great if my new PC comes tomorrow because I can go on Wednesday. It was a lovely day today, I and my family was going to enjoy AIR TATTOO last weekend, but both of them were canceled because of heavy rain. If it should be today, we were very happy. I found my PC was going to be dispatched when I checked it on DELL's website. SOOOO QUICK! I was very pleased with it. I was busy today, I ordered my PC at DELL Online Shop. My order will be delivered on or before 31 July. Great. I tidied up the lawn in my garden which had been left for a long time. I and my husband had been busy these weeks, so our garden was very wild... I had a mower but it was lack of its engine oil and didn't work. I had to use a electric cutter today. It was very easy to use, but took a long time to finish. I understood why there was a mower in the world. I was going to plant my daughters flower, but I couldn't because of my fatigue. I'll do it tomorrow. It was the last day before summer holiday for my children. They did their best this year. My son got GOLD PRIZE with his every great efforts. My daughter spent her first school life. She made a lot of friends and achievements. Congratulations both of them. Well done! Therefore my little girl was bit sad today. She knew she had to leave from the present class and her teachers. She hug both of them one by one. It was very touched to me. My daughter gave presents to her class teachers. They were pleased with it and hug her. My girl was a bit shy but seemed to be pleased, too. I brought a bath chair to the charity shop as I did yesterday. I saw another woman at the till and gave it to her. 'Don't you need this any more? ', she said to me with smiling. The farmers' market is held in the town centre every Thursday. I bought 3 pots of Gold Crest for my front garden. I'll plant them tomorrow. Britain and Great Britain (GB) consists of England, Wales and Scotland, and the eighth biggest island in the world. The British Isles consists of Britain, both parts of Ireland, the Isle of Man and the Channel Islands. The United Kingdom (UK) consists of England, Wales, Scotland and Northern Ireland. It is 1,000 kilometres from north to south and 250,000 square kilometres in size. England is just a part of Britain. People in Scotland, Wales and Northern Ireland sometimes get angry when they are called 'English'. Keep it in mind. There are many people whose parents originally came from the Caribbean, India, Pakistan, Hong Kong and other places in the 1950s and 1960s. Most of them live in the big English cities like London, Manchester and Birmingham. I went to the charity shop to donate a small slide. It was used by my daughter when she was a baby. As it had been bulky for these years in a cupboard, I tried to sell it on ebay, but failed. The shopkeeper was pleased with it because it was beautiful as its age. After I gave it away, I walked around the town centre to buy a pair of sandal. I bought a pretty pair at the shoe shop. I'm very happy with it. Finally, I went to the primary school that my little girl went to. Her class teacher was selling 'Plants in a Boot' to raise money for school. Children in the class had been looking after their own flowers in boots for several weeks. I bought my daughter's plants. It was in a pink boot and had a yellow flower. I'm going to plant it in our garden tomorrow. The United Kingdom consists of England, Wales, Scotland and Northern Ireland. The capital of England is London. It's the biggest city in the UK and over 7 million people live there. Manchester and Birmingham are in England, too. Cardiff is the biggest city in Wales and over 321,000 people live there. The River Severn, the longest river in the UK, starts in Wales and goes down through England. Scotland has its own parliament. The Scottish Parliament is in Edinburgh and nearly 500,000 people live there. There is also Ben Nevis, the highest mountain in the UK. It is 1343 metres high. Northern Ireland is only 21 kilometres away from Scotland at its nearest point. There is the biggest lake in the UK named Lough Neagh. The English Channel is between the UK and France. Its width is only 30 kilometres at its narrowest points. I try to encourage myself to read regularly. I don't know whether I can do it or not, but I'd like to . I chose a book titled British Life, because it is easy to read for me. I summarize each page with my words. I think it will work to brush up my English skill. 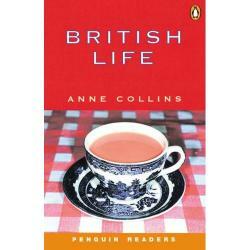 Most books written about Britain are good for tourists but they don't tell us what the British life is. Anne Collins, the writer of this book, will do it. In this book, she gives us some opportunity to know the ordinary British people. What is the most popular pet in Britain? How important sport and the National Lottery? We can find them later. Anne has been living in Scotland for these 6 years. She loves everything of Scotland but its weather. I couldn't go and see Mary-Anne today because I couldn't go there. Urgent business discouraged me from attending today's lesson. So I emailed her to tell my absence. Silly me. I've missed my daughter's Sport Day. I had been looking forward to cheering her... When she did her best at school, I tidied up my garden! Silly me, silly me. I apologized her and she forgave me. My small girl must have missed me. I wish the time could roll back. I'm so sorry, my girl. I started to join the English class today. I saw a new friends who were much younger than I, I suppose. Some of them were here just for this summer and others were college students working in U.K. The tutor's name was Mary-Anne. She was very nice lady. After class, I talked her that I was going to have an IELTS test near the future. She listened to me carefully and gave me some advices. She offered me to tell me her recommendation about good exercise book tomorrow. I look forward to know it. New day, new things, bit tired. That's OK.